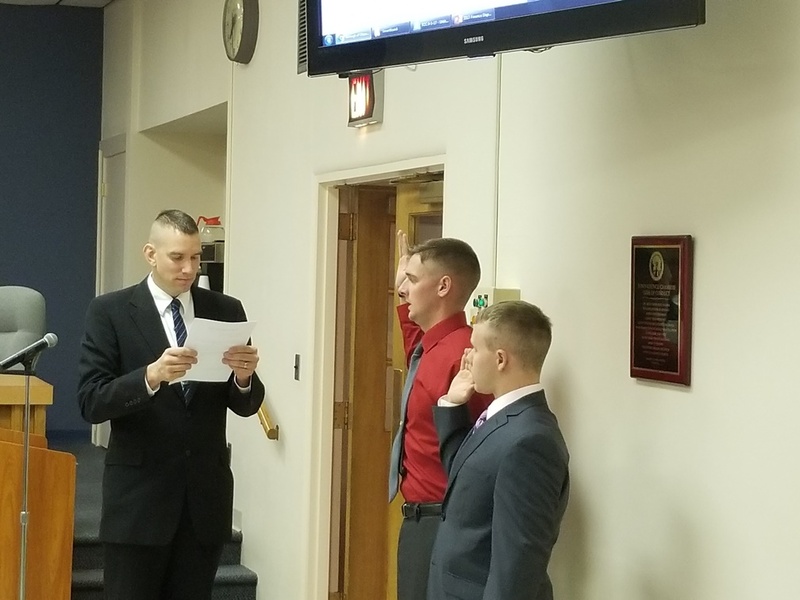 The second and third of the newly hired firefighters were sworn in by Mayor Brown at Monday night's Council meeting. Robert Barrett is a member of the Russell Volunteer Fire Department which led him to enlist in the Marine Corps Reserves as a crash fire rescue firefighter. Drew Nunemacher is a volunteer member and part-time employee with the United Fire Company of Montrose, Kingston/Forty Fort Fire Department, and the Larksville Fire Department. Barrett and Nunemacher joined the Department after several weeks of pre-employment testing and interviews. Barrett began his first shift on September 12th and Nunemacher on September 13th. Both are registered to attend the HACC Fire Academy in September.